ALBUQUERQUE (AP) Developers of a $2 billion project that will serve as a path to get renewable energy from New Mexico and Arizona to large markets in the American Southwest are looking to clear another regulatory hurdle as they move toward starting construction on two massive transmission lines and other infrastructure. 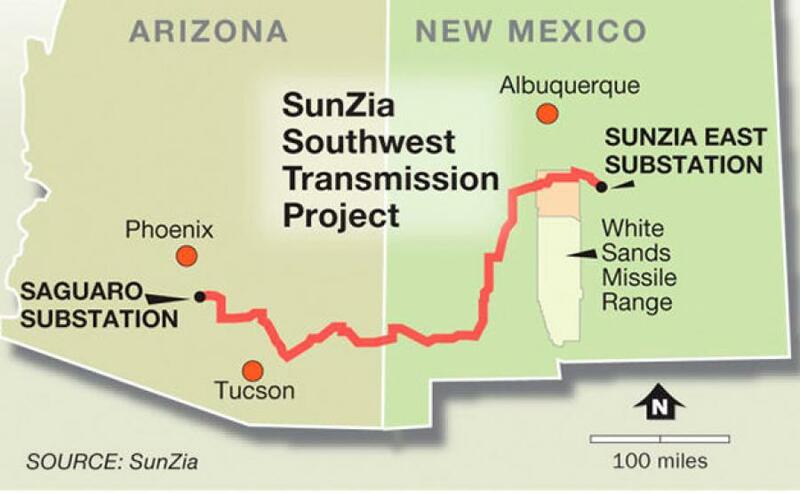 SunZia quietly submitted its application in March to the New Mexico Public Regulation Commission for approval of transmission line locations and right-of-way widths. A hearing examiner with the agency in an order this week set the stage for the approval process, which will include testimony from experts and a public hearing in June. The project has been years in the making and not without controversy as disputes initially rose over its proximity to a U.S. military installation and environmentalists raised concerns about effects on wildlife. The proposed transmission lines would cross about 520 mi. (836 km) of state, federal and private land in the two states. It took federal land managers about six years to review the project's potential effects on everything from the rural desert landscape the lines would cross to historical resources scattered throughout several counties. White Sands Missile Range, Holloman Air Force Base and officials at New Mexico's spaceport also weighed in. In Arizona, regulators gave their approval for the lines in 2015 following more than a dozen public hearings. Developers said in their application with the New Mexico commission that they're expecting final approval from the U.S. Bureau of Land Management to proceed later this year and that a right of way permit from the New Mexico State Land Office is expected in the coming months. SunZia also is pursuing easement agreements with more than 80 private landowners in southern New Mexico. Developers want to start construction later this year, with the goal of commercial operations beginning in 2020. Aside from opening up the potential for more wind and solar development in rural areas of New Mexico and Arizona, the project is expected to generate thousands of construction jobs along with lease payments and tax revenue for local and state coffers. A study by Anthony Popp, a consultant and professor emeritus of economics at New Mexico State University, indicates that construction could result in labor income impacts between $214 million and $461 million. Popp is among the consultants and lawyers who have submitted testimony to the Public Regulation Commission.